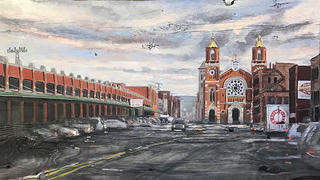 When a historic Pittsburgh building is demolished, oil painter Cory Bonnet salvages what he can. He uses the old materials as his canvas for creating evocative scenes of Pittsburgh’s past and present. 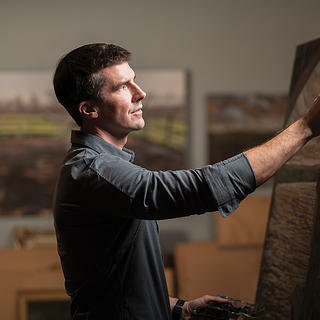 With an eye toward educating young people, Bonnet helps preserve, through his paintings, the stories of the city’s built environment. We recently spoke with him about his unusual career path and the intent behind his work. What drew you back to Pittsburgh after college? I grew up in Pittsburgh at the end of the 1970s and through the ’80s, which was not an optimistic time. The feeling was that you have to get out of this city if you’re going to make something, especially in a creative field. But every time I came back, I kept bumping into people who were committed to making Pittsburgh a better place. And that was exciting, to be able to get involved on the ground level of trying to bring Pittsburgh back. I just love it, as a painter. The area is very dynamic and interesting, geographically and architecturally. How do you select which places you want to feature? When I decide to paint something, it’s typically not because I saw it one time and think it’s cool. It’s because over the past 20 or 30 years, I’ve interacted with these spaces thousands of times with different people in different contexts. It’s the culmination of all these experiences finally bubbling up to where I can’t ignore it anymore, and I get this kind of vision of how I want to present it to an audience. I want to show them that even though they’re simple structures, there’s a real dignity and meaning to how and why they were built. I try to get people to focus on what happened there and what the story is behind these places. 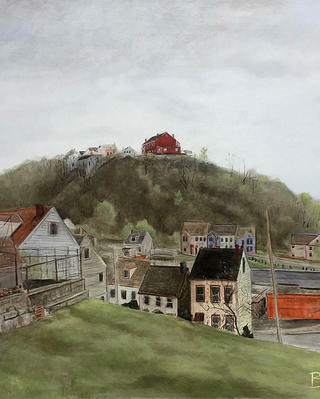 "Northside Vision" depicts a neighborhood with some of the oldest building stock in Pittsburgh. I salvage painting surfaces for landscapes and cityscapes from multiple sources. Some are fallen trees that are milled and joined into panels; others are from barns and old buildings—all from the general area of the subject being painted. The cityscapes are painted on materials from demolished buildings in the neighborhood being depicted, or as close as I can get. What are you hoping to convey about historic preservation in your work? [Sustainable design is] the bridge between the past and the future. We need to look at the resources we have and figure out how to couple historic structures with the innovation and technology of today to make something that’s going to benefit us not just today, but in the future, as well. Bonnet incorporated 23-karat gold leaf into "Visions of Smallman," which highlights St. Stanislaus Kostka Church on Smallman and 21st Streets. My focus is on getting youth interested in preservation so that when they move forward, they’re taking these ideas into school and their professions. I did a drawing and painting class with foster kids, Painting for Preservation, that ran for several weeks starting in November. Our [subjects] were historic buildings and places that the kids got to pick themselves. One of the main goals is to develop a sense of belonging and community in the foster kids so that they feel connected to their environment and understand their place in the history of their neighborhoods. I believe this will help build a foundation of stability that [will show them] that regardless of their situation, they are a part of the bigger picture. That they belong, and that Pittsburgh is their home. I think preservation helps show them how people in the past have contributed to changing their neighborhoods. Nicholas Som is an editorial assistant at Preservation magazine. He enjoys museums of all kinds, Philadelphia sports, and tracking down great restaurants.